'Baby Bear' pumpkins produce small, sweet orange pumpkins shaped like a flattened globe. 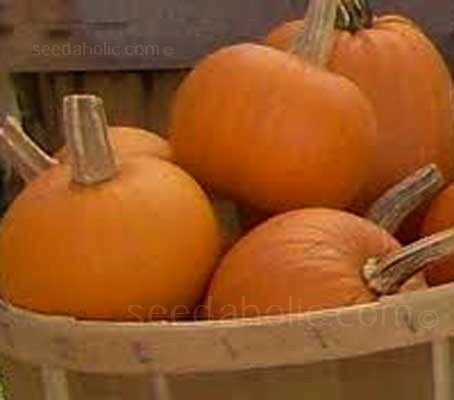 With high yields between five and eight pumpkins per vine and superior storage qualities, but the best thing about them is that they are extremely easy to grow. Baby Bear is a unique size and shape, and is often called "the perfect mini pumpkin" by growers. Deep orange and weighing around 2lbs. 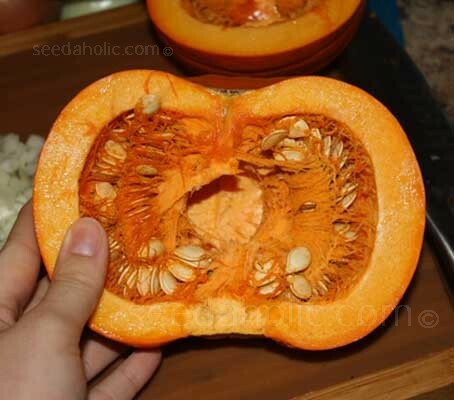 The fruits are about half the size of a normal pie pumpkin. With slender, sturdy, easy-to-grip handles, they are very appealing to children. 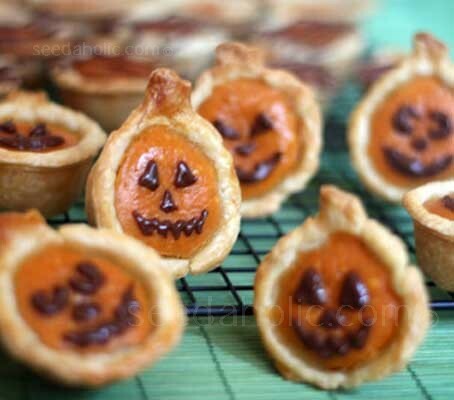 One of Baby Bear's parents was New England Pie and the other was a small "naked" seed pumpkin, so in addition to its decorative use, the flesh is excellent for pies and the hulless seeds can also be eaten, either raw or 'toasted', their taste resembles cashew nuts. Choose a sunny, sheltered spot with moisture retentive, humus rich soil. Improve the soil by digging in some well-rotted manure or compost. The simplest way is to dig a hole 30cm (12in) deep and 45cm (18in) across and fill it with well rotted compost or manure. Cover with a 15 to 20cm (6-8in) layer of soil to make a raised mound that will provide drainage along with a rich source of nutrients. To get the best results ensure you have good, nutritious growing compost and that you feed them through the season. Sowing: Sow indoors in pots April to June or sow direct from mid May to early June. Germination of pumpkin seeds is about 2 weeks and requires temperatures above 20°C (68°F). If grown entirely in a heated greenhouse seed can be sown in situ in late winter, or early spring for transplanting to a cloche or cold frame. 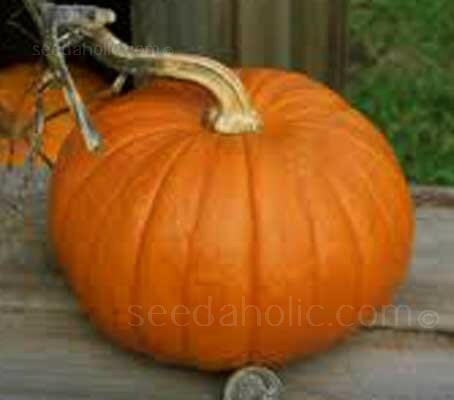 If you do not have any glass, then delay sowing pumpkin seed until late spring to avoid damage from heavy frost. Harvesting: Harvest August through October. Around 95 days. Pumpkins can be harvested whenever they are a deep, solid colour and the rind is hard. Harvest in late September or early October, before heavy frosts. Fruits subjected to a hard frost will not keep, so harvest should be completed before cold weather. Store them in a moderately warm, dry place until Halloween. Cut pumpkins from the vines carefully, using pruning shears or a sharp knife and leave 7 to 10cm (3 to 4in) of stem attached. Snapping the stems from the vines results in many broken or missing "handles." Pumpkins without stems usually do not keep well. Wear gloves when harvesting fruit because many varieties have prickles on their stems. Store only those fruit that are free of cuts, wounds, and insect or disease damage. Immediately after harvest, the fruit should undergo a ripening or curing process to harden the shell. A curing period of about two weeks at 24 to 30°C (75 to 85°F) with good circulation is desirable. Storage should then be at 10 to 20°C (50 to 70°F). Pumpkin carving, it is perhaps the biggest tradition of Halloween. But it's not the first vegetable to be carved. Long before pumpkin carving became popular, Celtic people in Ireland were carving turnips and lighting them with embers, to ward off evil spirits. This Celtic custom was the historical root of pumpkin carving. Pumpkins are native to America and in those days, pumpkins were not found in Ireland. As Irish immigrants travelled to America and took their traditions with them, they discovered pumpkins and quickly discovered that hollow, softer pumpkins, were much easier to carve. Carving turnips dates back many hundreds of years, to ancient Celtic customs and traditions. This was commonly done on All Hollow's Eve, of which Halloween takes much of it's origin. Carving turnips never quite caught on in America.....thanks to pumpkins.